This article is about the amiibo-based board in Mario Party 10. For Toad's board in Mario Party 4, see Toad's Midway Madness. 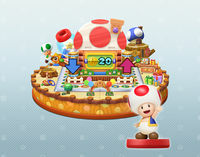 The Toad Board is a board that appears in Mario Party 10. It is available exclusively in the amiibo Party mode, where it can be played on when the Toad amiibo figure is scanned on the . Like the other amiibo boards, the Toad Board is based around a certain character, who in this case is Toad. The board seems to take some inspiration from Toad Town. Toads, miniature trees, Toad Houses, and presents can be found on the board. The board features star-based gimmicks. The giant Toad House changes the price of the Star(s) to make it higher or lower. Landing next to one of the Star Cannons launches more Stars onto the board (1 to 3 stars based on the cannon). The music played on the board is a remix of the Toad House theme in Super Mario Bros. 3. When the player passes through the area in the top-left corner, a new coin cost of the Star will be set. That means the player may have to pay a different amount of coins than usual to get the Star located on the board. The coin cost of the Star can equal 10, 15, 20 or 25 depending on the roulette results. As default, it is 20 coins. If the player lands on the Event Space, the amount of Stars shown next to the cannon will be shot from it. The Stars shot from the cannon will land on different spaces. After one of the players collect the last Star, a new one will be located. During the Homestretch event, the amount of Stars on each space will be doubled, even in the cannons. An image from the Japanese website showing the giant Toad House. This page was last edited on January 3, 2018, at 20:36.